The second 50 rounds were as above, but with a full charge of 35 grains of 3Fg Goex and no cornmeal filler. My point of aim was at 6:00 on the bullseye. Can't complain about that. In the video I was shooting the full-power .44 WCF loads with 35 grains of powder. The rifle hangs really nicely for offhand shooting although at about 9 lbs. it's heavy. Recoil is very mild. Functioning was excellent and the action is slicking up, being noticeably smoother now than when it was fresh out of the box. 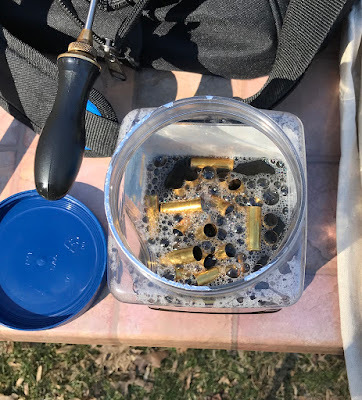 After shooting, we dropped the spent cases into a jar of soapy water to clean off most of the black powder fouling. This took care of most of the fouling but I'm going to run them through my case tumbler for about 30 - 60 minutes. This was the most black powder loads I've put through a rifle in one outing. The action got no fouling in it. The bore took only about 10 - 12 patches wet with moose milk (Ballistol/water mix) to get clean. I'm going to load up some more of the .44 Henry-equivalent loads and use them at my club's next lever action shoot. 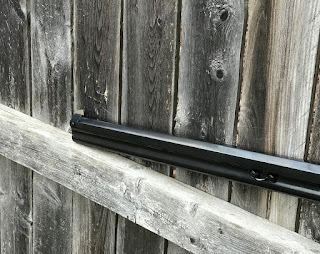 I'll also run some mild smokeless loads with Unique through it, and I've recently read some pieces that indicate Herco is a good smokeless powder for use in .44 WCF, so if I see any at the next gun show I'll pick up a pound. It's a little slower and I think bulkier than Unique, and may meter better, which would be a plus. 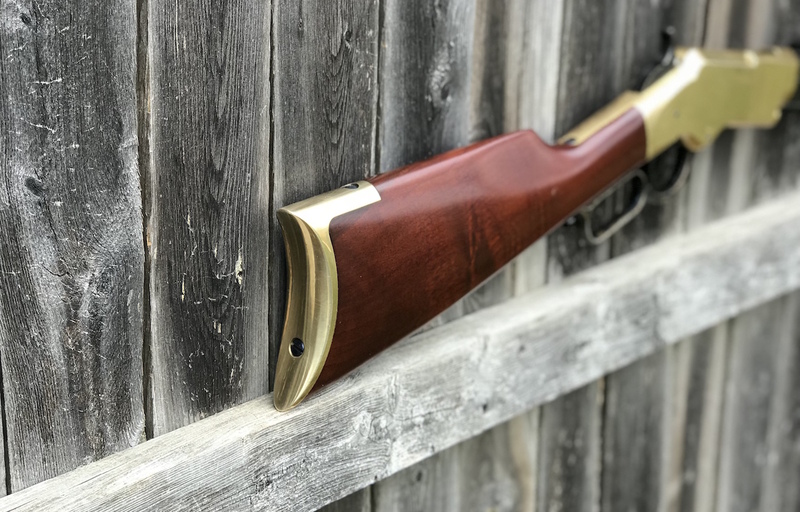 Incidentally, we also shot my circa-1895 Winchester 1892 .38 WCF at the gong, with smokeless loads of a 180 grain cast bullet on top of 9.0 grains of Unique. These were noticeably more powerful than the Ultramax .38-40 cowboy ammo I'd shot in the rifle previously. However, even the .44 Henry-equivalent loads in the 1860 smacked the gong around a lot more. 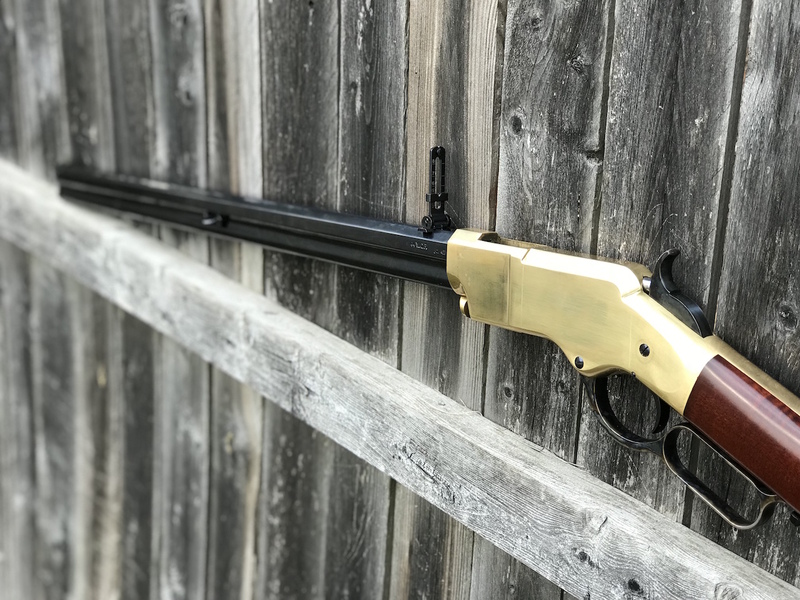 A couple of weeks ago I ordered a Cimarron Firearms 1860 Henry Civil War model rifle from Buffalo Arms, the same place I got my Cimarron 1873 Sporting Rifle from two years ago. The Henry arrived at my FFL last week and I did the transfer on Thursday. 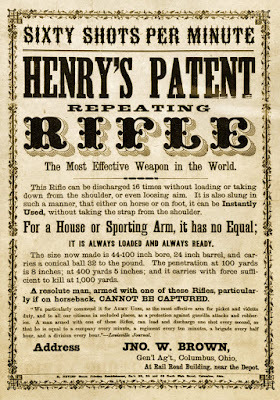 Like the 1873, the Henry is chambered for .44-40 / .44 WCF. I shot it for the first time yesterday. As shown in the above picture, a sling swivel is mounted on the stock. I got a sling from Dell's Leather Works, which came from NY to PA in about 3 days. This shows the German silver front sight blade and the sling attachment loop on the barrel. The rear sight is a folding ladder. When folded, it's set for 100 yards. It's then graduated out to a very optimistic 800 yards. It also has a notch on the very top which may be for 900 yards. Most Henry replicas come with a trapdoor in the buttplate which covers a cavity in the stock that accepts a four piece cleaning rod. My rifle doesn't have that, however. I plan to pull the buttplate off and see if the stock is drilled for a cleaning rod. If so, I may swap out the buttplate. Overall, the rifle is extremely well finished. Wood-to-metal fit is excellent and the action works smoothly (and it's getting smoother as it gets worked). Aside from the high quality, the other initial impression is that the rifle is heavy. 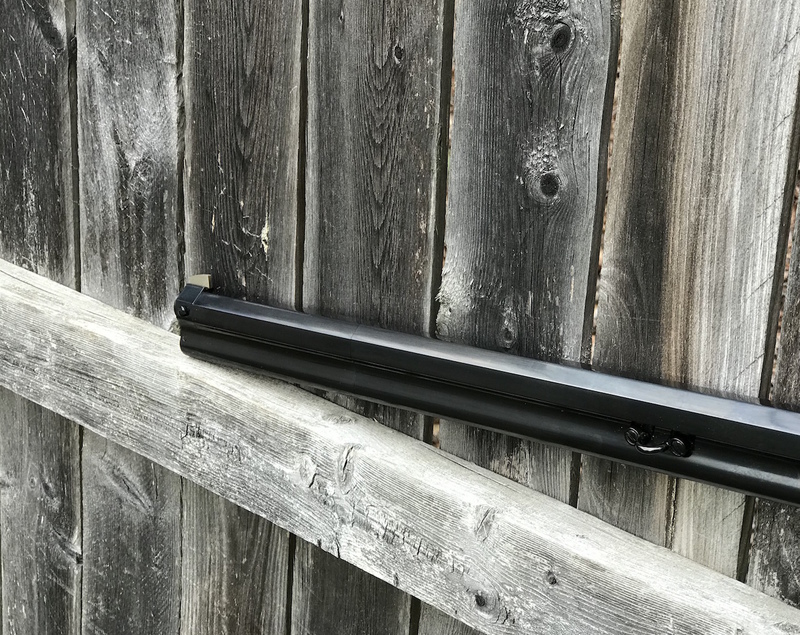 It weighs in around 9 pounds, partially due to the weight of the brass receiver and partially due to how the magazine tube is machine from the same piece of steel as the barrel. 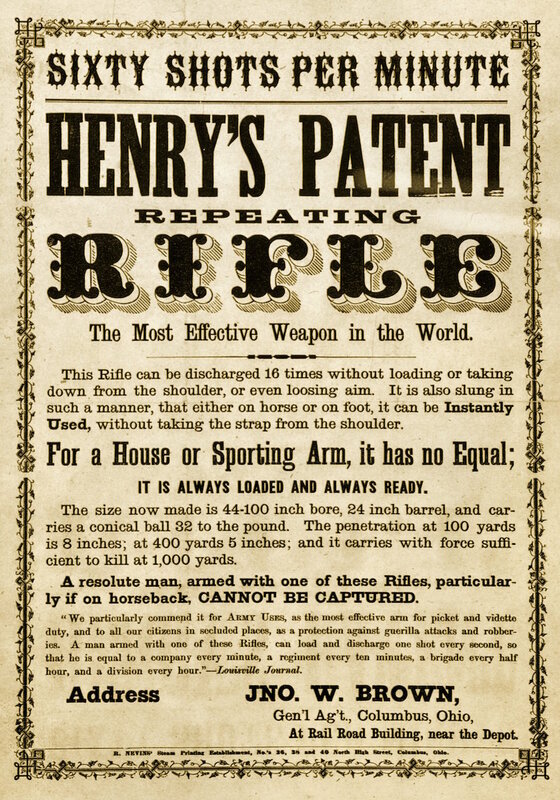 In my next post I'll talk about shooting it, but I wanted to leave off with this, a facsimile of an 1860s Henry Rifle advertisement. 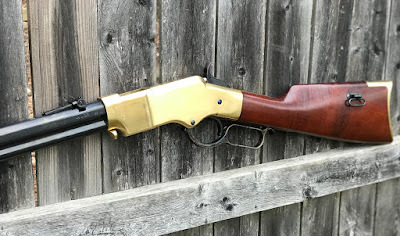 Yesterday I attended for the first time one of my gun club's lever action rifle matches. 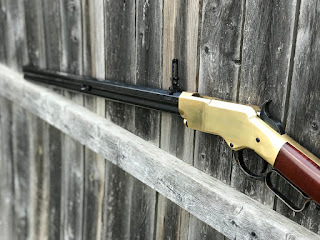 I shot my Cimarron 1873 Sporting Rifle with my .44-40 handloads of bullets cast in the Accurate 43-215C mold on top of 35 grains of Goex 3Fg black powder in Starline brass. Normally, the lever action matches involve shooting steel plates at 25 yards and 50 yards, but due to recent weather the range was a bit swampy. 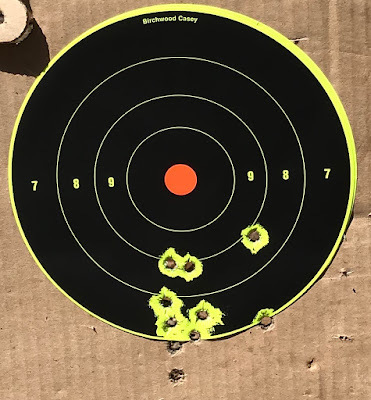 So, we shot at 25 yards only. Each of the first 9 relays was 5 shots on ~8" steel plates, against the clock. The final relay was 5 shots on one plate, against the clock, and if you didn't miss any, 5 seconds would be deducted from your total time. Cimarron 1873s were the most common rifle choice, but mine was the only one with a 24" barrel. The rest were 20" short rifles in either .45 Colt or .357. One guy was shooting an Uberti 1866 Carbine in .44-40. He and I were the only guys shooting .44 WCF. We had a couple rifles from Henry and one Marlin 1894 Cowboy with 24" barrel. Finally, we had one guy shooting a Rossi 92 in .454 Casull but loaded with .45 Colts. I was the only one shooting cartridges loaded with black powder. 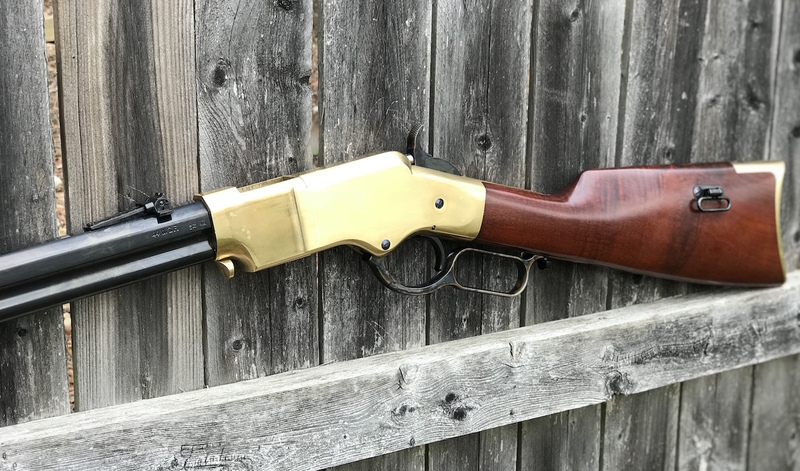 Everyone else used smokeless and mostly were light cowboy action shooting loads. I saw a few feeding issues at least one of which was due to short-stroking, and the 1866 went down at one point due to a squib load. I am pleased to say that my rifle ran flawlessly. Cleanup of my rifle afterwards was a snap. The thin .44-40 brass really seals the rifle's chamber so no fouling got back into the action. The bore needed about a dozen patches wet with moose milk (Ballistol/water mix) to get clean. Then, a couple dry patches and then two more with straight Ballistol. The match was an absolute blast. Today I got an email with the scores and was happy to see that I came in third. Considering that the two guys who placed ahead of me were shooting mouse fart-level smokeless powder loads, I have absolutely no complaints. I think I'll being doing it again.